Researchers at Western have developed an objective way to monitor female athletes’ concussion injury, by using brain scans to study their brains over time. By using a technique that combines both structural and functional MRI information, Western University researchers were able to identify three unique signatures – one that shows acute brain changes after an athlete has suffered a concussion, another that can identify persistent brain changes six months after the concussion and a third that shows evidence of concussion history. “Diagnosis of concussion is subjective right now,” said Ravi Menon, professor at Western’s Schulich School of Medicine & Dentistry and senior author of the study. The study included 52 female athletes from the women’s varsity rugby team at Western during a regular season of play, including 21 who suffered a concussion. In collaboration with researchers from the Donders Institute in the Netherlands, the research team used a technique that combined multiple imaging measures to show structural and functional information at the same time. The result: a much more sensitive and complete picture of concussion injury. “This study highlights the important contributions advanced imaging techniques can make in helping clinicians understand what happens biologically in the brain when players become concussed – and these improvements translate into better clinical decisions,” said Christian Beckmann, DPhil, professor of Statistics in Imaging Neuroscience at the Donders Institute and the Radboud University Medical Centre Nijmegen in the Netherlands. 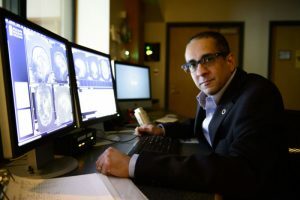 Menon said the imaging studies were done on a 3T MRI, which is the standard of care in most hospitals and clinics and which makes this method easily translatable clinically. The study was funded by Schulich Medicine & Dentistry, Brain Canada, Western’s BrainsCAN, and National Sciences and Engineering Research Council. Manning KY, Llera A, Dekaban GA, Bartha R, Barreira C, Brown A, Fischer L, Jevremovic T, Blackney K, Doherty TJ, Fraser DD, Holmes J, Beckmann CF, Menon RS. Linked MRI signatures of the brain’s acute and persistent response to concussion in female varsity rugby players. Neuroimage Clin. 2018 Dec 3. pii: S2213-1582(18)30375-9. doi: 10.1016/j.nicl.2018.101627.